It happened in the old days at Rome that a slave named Androcles escaped from his master and fled into the forest, and he wandered there for a long time until he was weary and well nigh spent with hunger and despair. Just then he heard a lion near him moaning and groaning and at times roaring terribly. Tired as he was Androcles rose up and rushed away, as he thought, from the lion; but as he made his way through the bushes he stumbled over the root of a tree and fell down lamed, and when he tried to get up there he saw the lion coming towards him, limping on three feet and holding his forepaw in front of him. 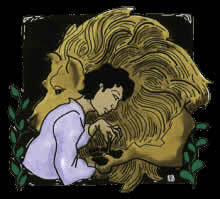 Poor Androcles was in despair; he had not strength to rise and run away, and there was the lion coming upon him. But when the great beast came up to him instead of attacking him it kept on moaning and groaning and looking at Androcles, who saw that the lion was holding out his right paw, which was covered with blood and much swollen. Looking more closely at it Androcles saw a great big thorn pressed into the paw, which was the cause of all the lion's trouble. Plucking up courage he seized hold of the thorn and drew it out of the lion's paw, who roared with pain when the thorn came out, but soon after found such relief from it that he fawned upon Androcles and showed, in every way that he knew, to whom he owed the relief. Instead of eating him up he brought him a young deer that he had slain, and Androcles managed to make a meal from it. 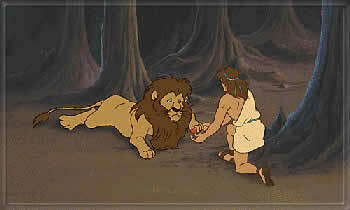 For some time the lion continued to bring the game he had killed to Androcles, who became quite fond of the huge beast. But one day a number of soldiers came marching through the forest and found Androcles, and as he could not explain what he was doing they took him prisoner and brought him back to the town from which he had fled. Here his master soon found him and brought him before the authorities, and he was condemned to death because he had fled from his master. Now it used to be the custom to throw murderers and other criminals to the lions in a huge circus, so that while the criminals were punished the public could enjoy the spectacle of a combat between them and the wild beasts. So Androcles was condemned to be thrown to the lions, and on the appointed day he was led forth into the Arena and left there alone with only a spear to protect him from the lion. The Emperor was in the royal box that day and gave the signal for the lion to come out and attack Androcles. But when it came out of its cage and got near Androcles, what do you think it did? Instead of jumping upon him it fawned upon him and stroked him with its paw and made no attempt to do him any harm. It was of course the lion which Androcles had met in the forest. The Emperor, surprised at seeing such a strange behavior in so cruel a beast, summoned Androcles to him and asked him how it happened that this particular lion had lost all its cruelty of disposition. 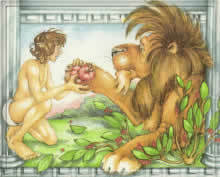 So Androcles told the Emperor all that had happened to him and how the lion was showing its gratitude for his having relieved it of the thorn. Thereupon the Emperor pardoned Androcles and ordered his master to set him free, while the lion was taken back into the forest and let loose to enjoy liberty once more. ---> forward to " the flying lion "